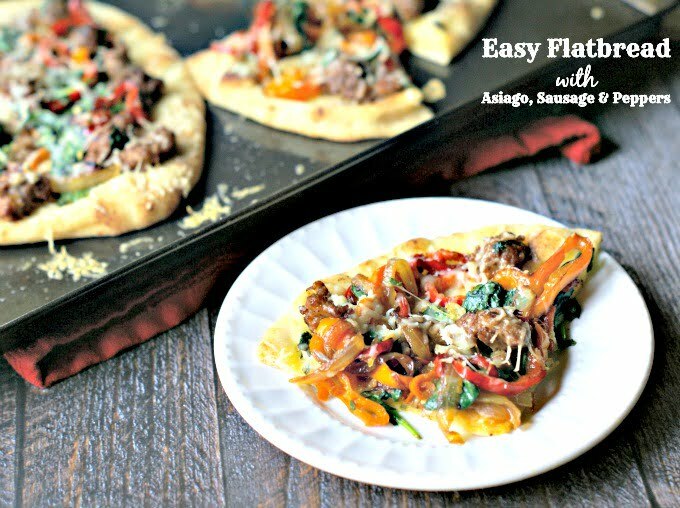 This easy flatbread is so delicious with toppings of sausage, peppers, spinach and Asiago cheese. Make a delicious dinner for your family in minutes. I am always trying to think of quick and easy dinners for my family. Some days are just too busy and the last thing I want to do is make dinner. But I like good food and feel guilty if I don’t take care of my family so this is our new go to dinner on those “crazy” days. It started when my son told me he liked naan bread. I was shocked to be honest… but also excited! He’s really starting to like different foods which is great. 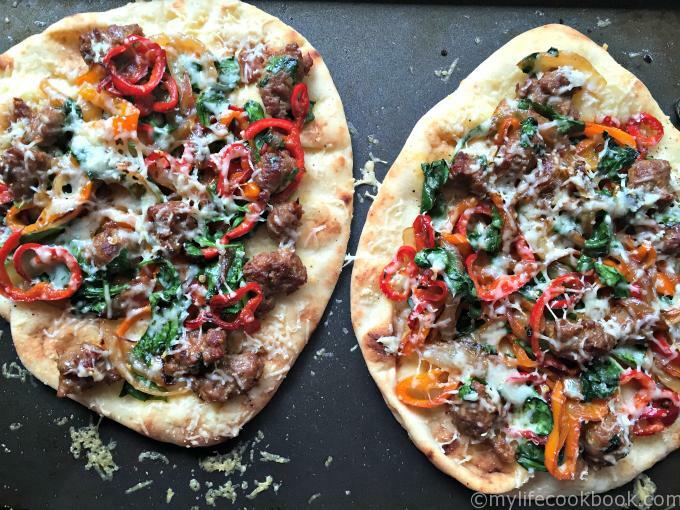 So I made this easy flatbread for me and my hubby. My son’s had sauce, pepperoni and cheese. He’s not there yet. 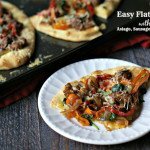 😉 These flatbreads are easy to make and very versatile. I bought everything at Aldi, even the naan bread. I told you they were quick and easy, but I forgot to mention inexpensive too! Naan bread makes the best pizza crust. It’s thin but chewy and very tasty. Anything you put on top of it is going to taste great. This is the naan bread that I bought at Aldi. There were 4 to a package and they are pretty big in size. I could only fit two on a cookie sheet and one is plenty per person unless you are a big eater. So the first thing you want to do is sauté your toppings. 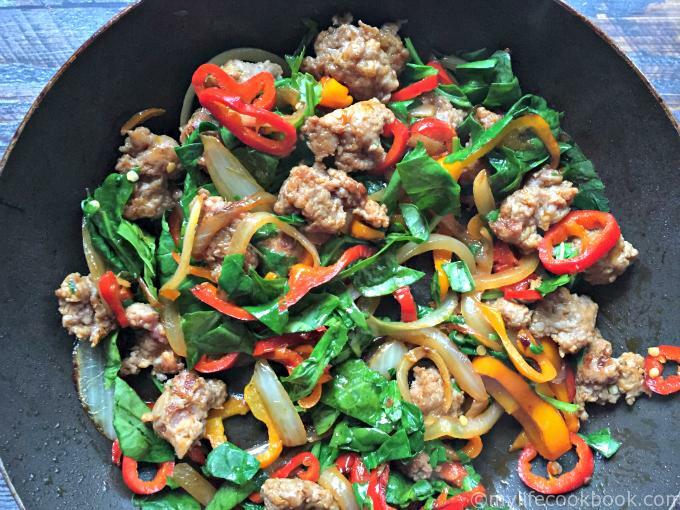 I started with the onions and peppers and when they softened I added the sausage. Here I used Italain sweet sausage. I think it has tons of flavor and I only used 1 link. Brown that along with the onions and peppers and at the end, add your spinach. You can take it off the stove and just mix the spinach in and it will wilt instantly. No need to cook it because it will have more volume when it’s just wilted. 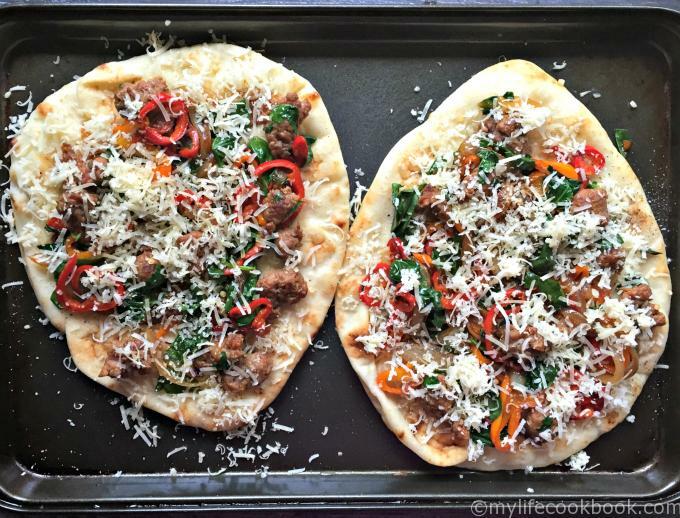 Now all that’s left is to assemble your flatbreads. I first brushed them with some olive oil and crushed garlic. This too gave it some good garlic flavor that I love so I wouldn’t skip this step. 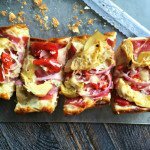 Add your toppings and top with Asiago cheese. Then pop them in the oven for about 10 minutes. You don’t want to bake them for too long because everything is already cooked and all you want to do is melt the cheese. Add more cheese if you like but the Asiago is very flavorful and so it doesn’t take much. You could also put these under the broiler if you want instead of the oven. I haven’t tried that but I’m sure it would work fine. See how lovely they come out! Oh they were so good. 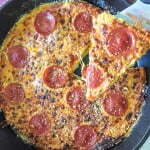 My husband went on and on about them and my son loved his pepperoni pizza too. So there’s another quick and easy dinner for you. I can’t wait to try out different combinations here. I’m seeing some bacon and avocados or maybe arugula and goat cheese in my future. So many things to try out. What do you like on your flatbread? Drop me a comment and tell me your ideas. I’d love to hear from you! In a saute pan, add 1 Tablespoon of olive oil and turn on the heat to medium high. Add your onions and sauté for 1 or 2 minutes. Next add your peppers and sauté for another 2 minutes. Take off the casing of the sausage link and crumble into the pan and cook until browned well. Mix remaining 1 Tablespoon of olive oil with garlic and brush all over both naan bread. Split your sausage topping in half and spread evenly over naan bread. Place in the oven for 10 minutes or until the cheese is cooked to your liking. Wow this is genius! This is a really quick and easy meal that’s great for a crowd. You have inspired me to do a make your own flatbread party for my next get together with friends. It’s so adaptable. It’s great for meat lovers, vegetarians, and health conscious people if you tweak the toppings. Thanks for sharing! Thank you Shawn! I don’t know if it was genius but it has been a great addition to our meals. Every week we make them differently but the naan is a lifesaver. I love Naan bread. 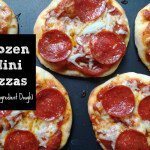 Great idea to treat them like pizza crust. Just want to take a bite of that. Yum! This is gorgeous! I love all those bright colors on there! Thanks Shelby! Hope you give it a try! 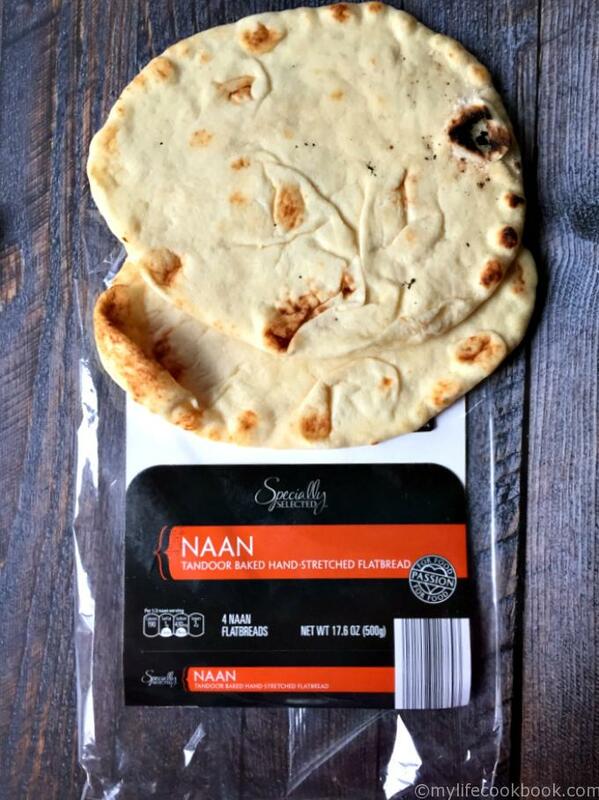 We always have naan in the freezer. What a great idea to use it for flatbread. I didn’t used to but now we always have it too. It’s perfect for this.